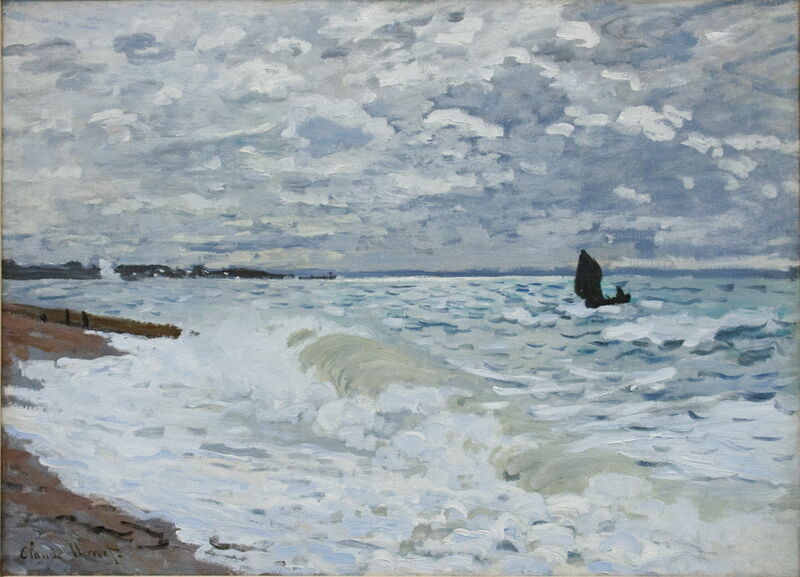 Claude Monet (1840–1926), Tempête, côtes de Belle-Île (Tempest, the Coast of Belle-Île) (1886), oil on canvas, 65.4 x 81.5 cm, Musée d'Orsay, Paris. Wikimedia Commons. By the late nineteenth century, coastal views had become part of the repertoire of most landscape painters, but relatively few had tackled the challenge of painting storms at the coast. Albert Bierstadt (1830–1902), Seals on the Rocks, Farallon Islands (c 1872-73), oil on canvas, 66 x 91.4 cm, location not known. Wikimedia Commons. 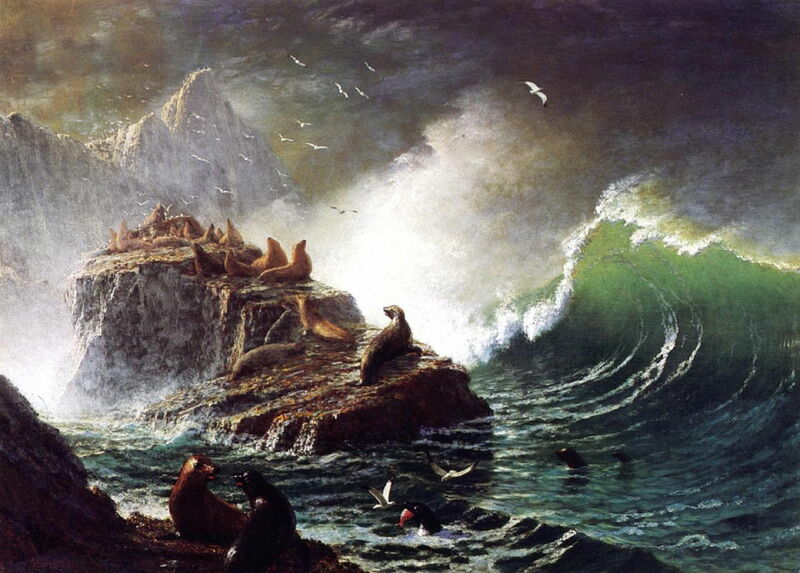 In May 1872, the great American landscape artist Albert Bierstadt visited the Farallon Islands, a group of uninhabited rocks thirty miles to the west of San Francisco. From this came his dramatic Seals on the Rocks, Farallon Islands (c 1872-73), one of a short series which he painted of the islands in those years. 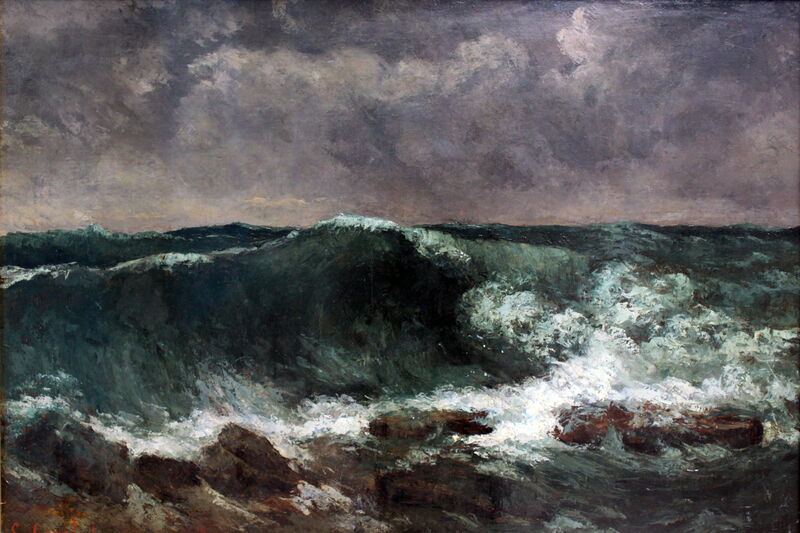 Gustave Courbet (1819–1877), The Wave (1869), oil, dimensions not known, Städelsches Kunstinstitut und Städtische Galerie, Frankfurt, Germany. Wikimedia Commons. Bierstadt most probably saw one of Courbet’s late paintings of breaking waves (above), which may have influenced him to paint one of his most famous works. Albert Bierstadt (1830–1902), The Shore of the Turquoise Sea (1878), oil on canvas, 163.8 × 108 cm, Private collection. Wikimedia Commons. Albert Bierstadt’s wife was diagnosed with ‘consumption’ in 1876, and the following year the couple visited Nassau in the Bahamas, where they hoped the warmer climate would help her condition. 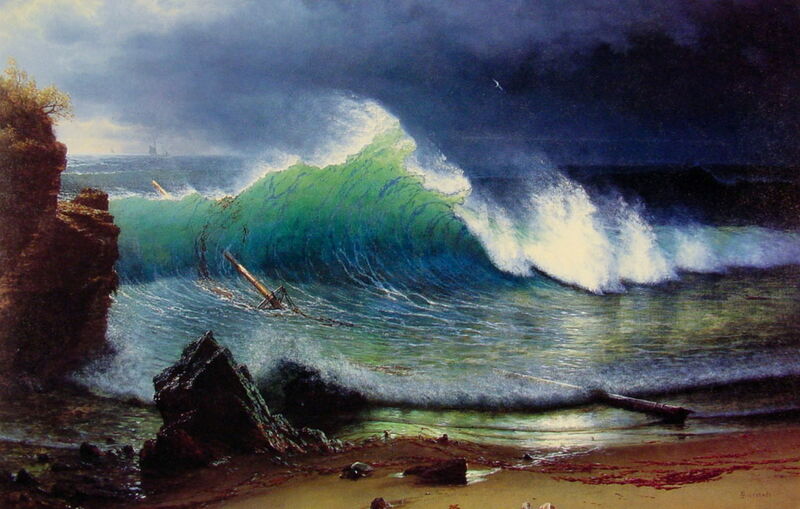 During that visit, Bierstadt was inspired to paint The Shore of the Turquoise Sea (1878), showing a wave breaking on the coast there, which he exhibited in 1878. He too has made the link back to earlier paintings with the subtle inclusion of some wreckage. He also painted a second, larger development from this work after 1878, now exhibited in the Haggin Museum in Stockton, CA, as After a Norther. The artist had been brought up from infancy in the whaling port of New Bedford, MA, but only painted about thirty coastal views out of a total of around five hundred catalogued paintings. After JMW Turner, the next landscape painter to specialise in the depiction of severe weather at the coast was Claude Monet. Although he was born in Paris, when he was only five his family moved to live in Le Havre, on the north French coast of Normandy, and it was on its beaches that Monet learned to paint en plein air using oils. Claude Monet (1840–1926), The Sea at Le Havre (1868), oil on canvas, 60 × 82 cm, Carnegie Museum of Art, Pittsburgh, PA. Wikimedia Commons. Monet’s The Sea at Le Havre (1868) was painted at the time that he was experimenting with highly gestural brushwork, which proves outstanding in its effect in the sky and sea here. Painting en plein air in such conditions was also formative experience for later in his career, when Monet returned to the north coast in more stormy weather. 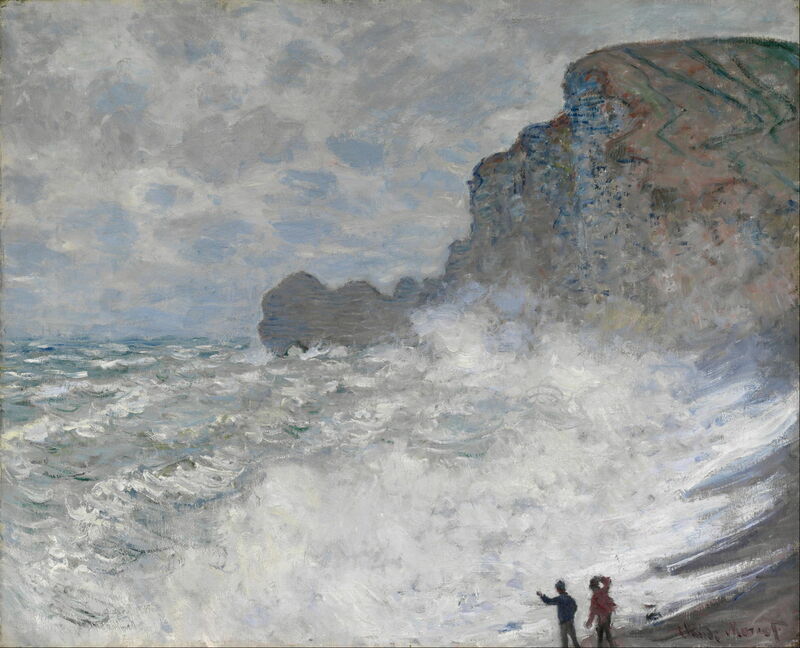 Claude Monet (1840–1926), Rough Weather at Étretat (1883), oil on canvas, 65 x 81 cm, National Gallery of Victoria, Melbourne, Australia. Wikimedia Commons. The distinctive chalk pinnacle, arch and cliffs at Étretat are only about twenty miles along the coast from Le Havre, and became a frequent motif in his painting (as well as in those of many other landscape artists). Monet’s Rough Weather at Étretat (1883) is one of a series of paintings which he made there from the beach during storms. In his almost daily letters to Alice Hoschedé, Monet told of episodes in which the waves nearly got the better of him, and he was almost washed away with his easel and canvas. Claude Monet (1840–1926), Tempête, côtes de Belle-Île (Tempest, the Coast of Belle-Île) (1886), oil on canvas, 65.4 x 81.5 cm, Musée d’Orsay, Paris. Wikimedia Commons. Monet’s most impressive paintings of storms on the coast were made during his stay on the offshore island of Belle-Île, which is at the northern end of the Bay of Biscay, and notorious for savage weather. His Tempest, the Coast of Belle-Île (1886) shows the spume from the breaking waves shooting high over the rock stacks around the island’s coast. While Monet was painting those works in his mature Impressionist style, the American Winslow Homer was living at Cullercoats, on the north-east coast of England, and painting its fisherfolk in watercolour – a formative period for him which I have detailed in a series of articles starting here. 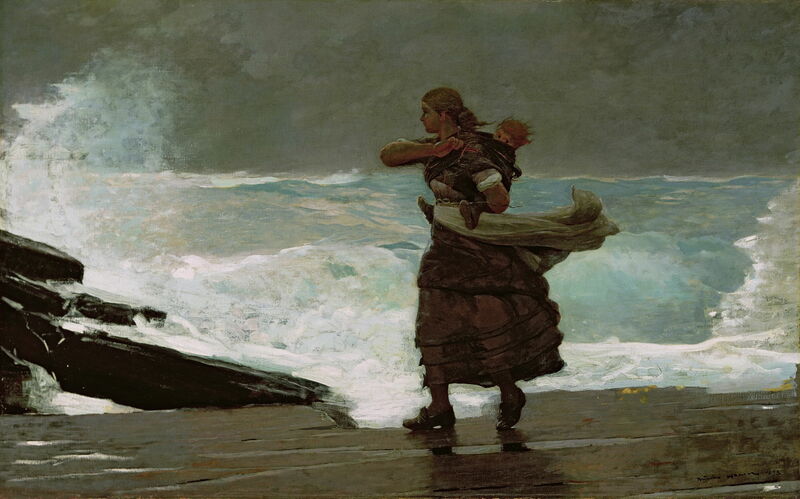 Winslow Homer (1836–1910), The Gale (1883-93), oil on canvas, 76.8 × 122.7 cm, Worcester Art Museum, Worcester, MA. Wikimedia Commons. Homer’s The Gale (1883-93) is probably one of the few oil paintings which he started at Cullercoats, and completed a decade later when he had returned to the USA. He went on to paint a succession of maritime views set in bad weather, several of which were very successful. Winslow Homer (1836–1910), High Cliff, Coast of Maine (1894), oil on canvas, 76.8 × 97.2 cm, Smithsonian American Art Museum, Washington, DC. Wikimedia Commons. 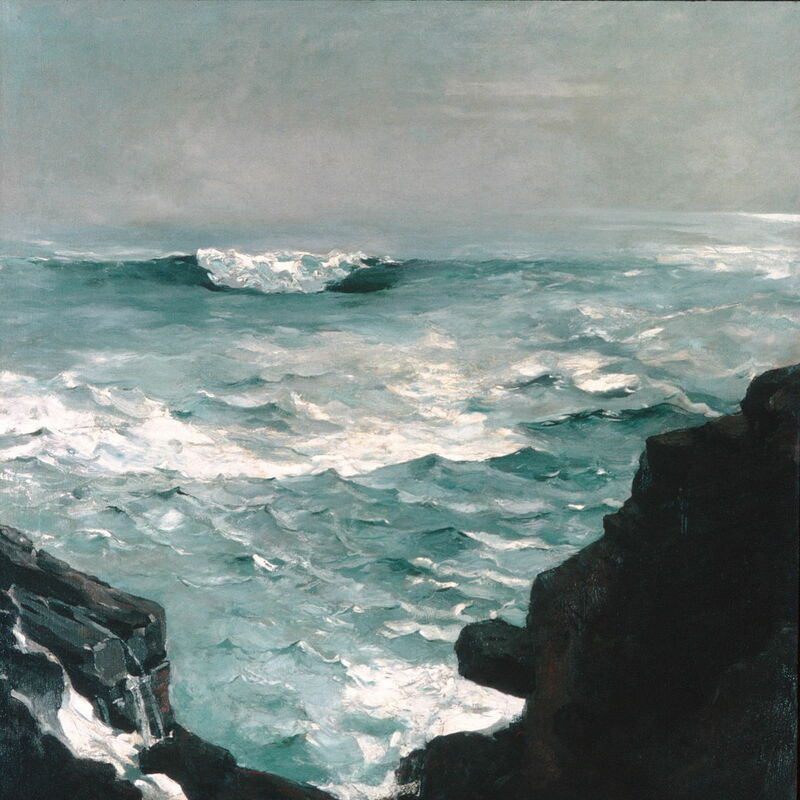 Some of Homer’s finest paintings of coastal storms were made when working around his studio at Prout’s Neck in Maine, late in his career. High Cliff, Coast of Maine (1894) shows the Atlantic swell pounding the base of this rocky section of coast, spume being blown up its face. Winslow Homer (1836–1910), Cannon Rock (1895), oil on canvas, 101.6 × 101.6 cm, Metropolitan Museum of Art, New York, NY. Wikimedia Commons. 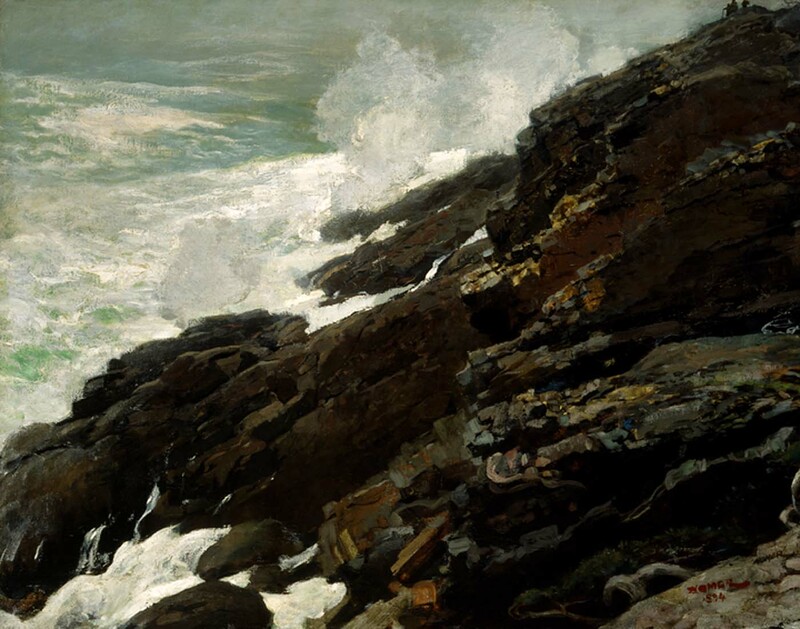 Although Homer has a reputation for careful realism, his painting of Cannon Rock (1895), also near his studio on the Maine coast, is a composite showing an impressive breaker which would only have occurred at low tide, but the inlet in the foreground shows a state of high tide. Several of the great Scottish landscape painters of the late nineteenth and early twentieth centuries took to working en plein air in the most challenging of weather conditions on the Scottish Islands, and there are photos of them doggedly painting the coast on large canvases which are lashed down to the ground. 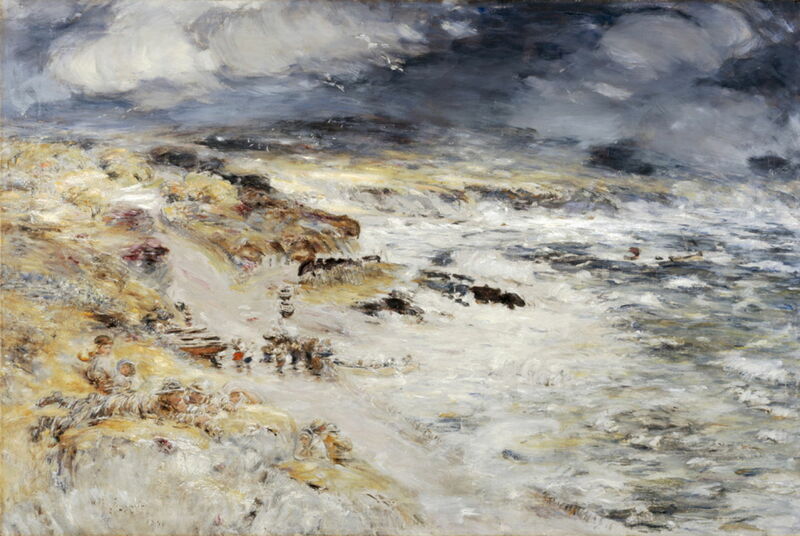 Among the best of their paintings of severe weather is William McTaggart’s The Storm (1890). This was made in the studio from a smaller oil sketch which the artist made in front of the motif at Carradale, on the Kintyre Peninsula, to the west of the Isle of Arran. This demonstrates the complete merging of sky, sea, and land which results in the most severe weather conditions. This painting was first purchased by the Scottish-American industrialist Andrew Carnegie. 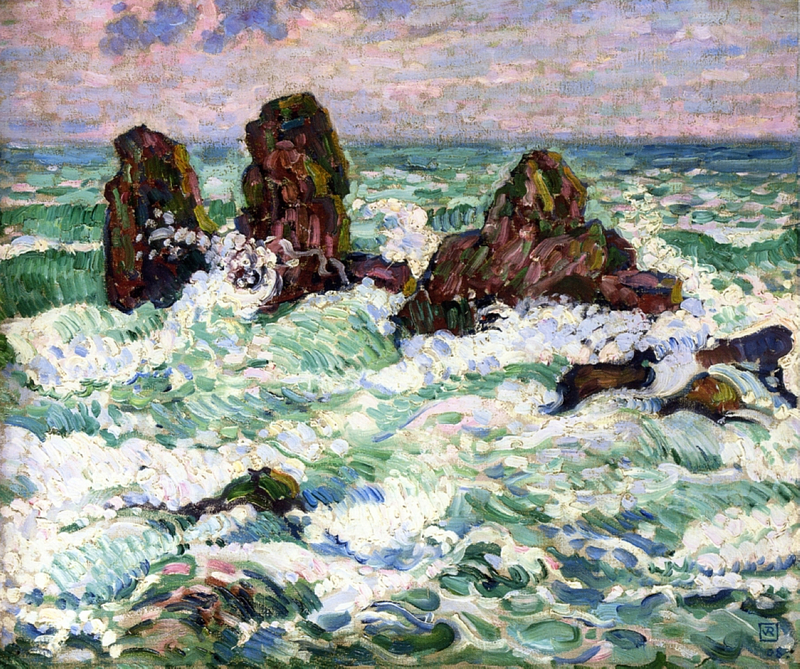 Théo van Rysselberghe, The Rocks (1908), oil on canvas, 46 x 55.9 cm, Private collection. WikiArt. 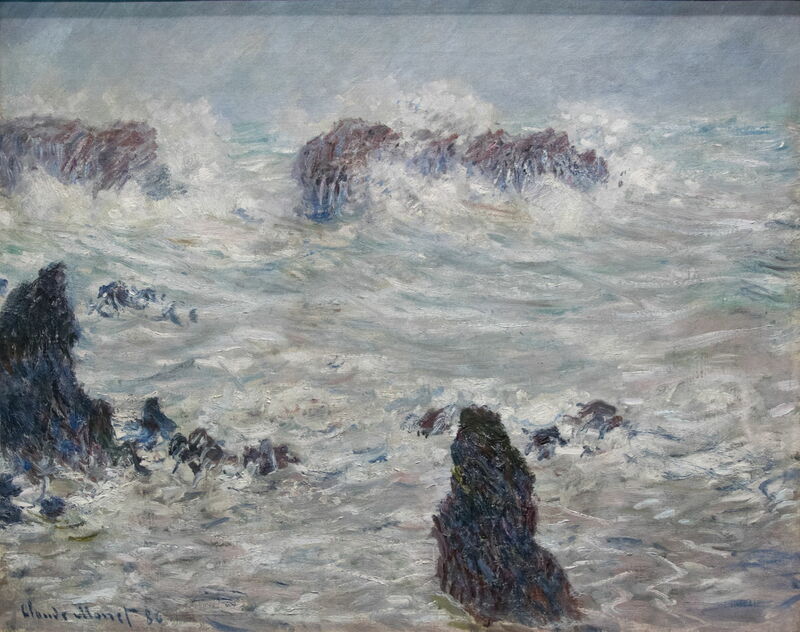 Coastal storms were also occasional motifs for Post-Impressionists, as in Théo van Rysselberghe’s The Rocks (1908), which makes interesting comparison with Monet’s paintings of a quarter of a century earlier. George Bellows (1882–1925), Sunlit Surf (1913), oil on panel, 38.1 × 49.5 cm, location not known. Wikimedia Commons. A few artists now better-known for their work in genres other than landscapes have also turned to painting maritime and coastal views. George Bellows, best remembered now for his brilliant and innovative views of New York’s human landscape, and of boxing, painted more than 250 works showing the sea. 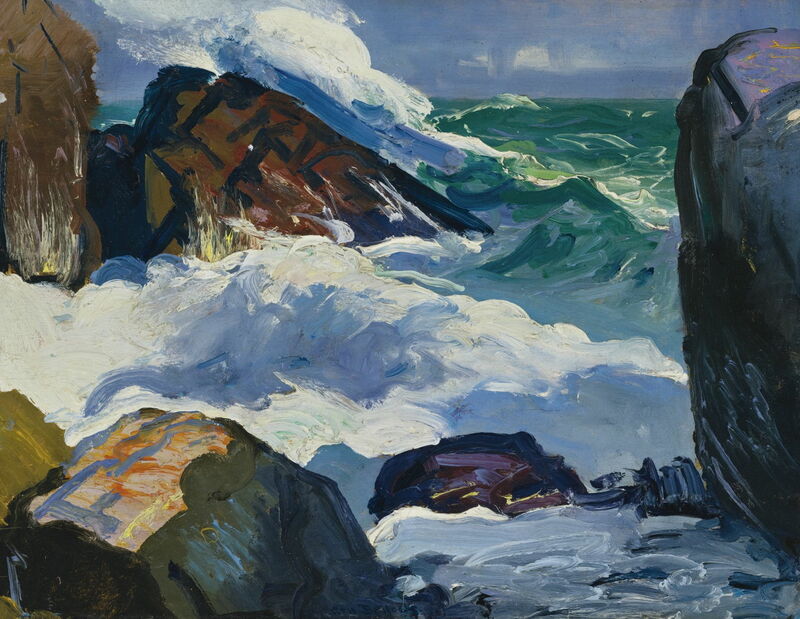 Among those is his Sunlit Surf (1913), which I believe was, like Homer’s views, painted on the coast of Maine. Perhaps for some artists the dramatic scenes of storms on the coast were also a reflection of the scenes of human drama which they painted. Posted in General, Life, Painting and tagged Bellows, Bierstadt, Homer, landscape, McTaggart, Monet, painting, van Rysselberghe. Bookmark the permalink. Thoughts on documenting macOS: do we have a project?